St. Patrick's Cathedral is a famous structure in Dublin, Ireland. Construction of the cathedral began in 1191. 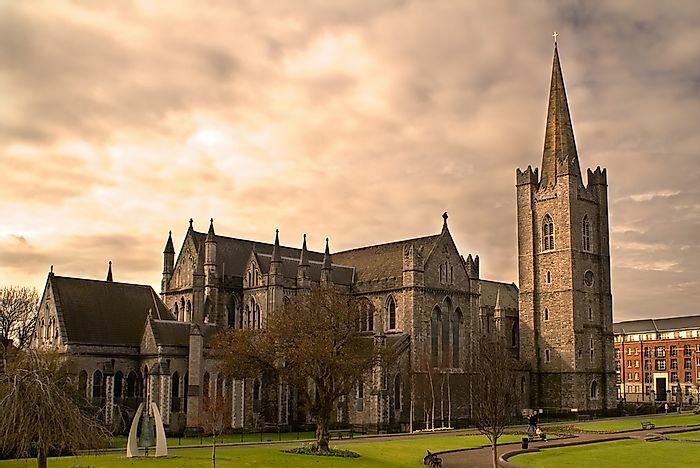 Dublin is home to one of the world’s most famous cathedrals, the St. Patrick’s Cathedral. As its name suggests, the cathedral was built in honor of St Patrick, a 5th-century Irish bishop. About 500 people lie buried in the compounds of St Patrick’s Cathedral, some being prominent Irish people such as Thomas Jones, Michael Boyle, and John de Sandford. St Patrick’s Cathedral is the largest and tallest cathedral in Ireland. However, there is much more about this colossal cathedral than its immense size. St Patrick’s Cathedral was formally consecrated on March 17, 1191, and dedicated to St Patrick. St Patrick was a 5th-century Christian missionary of Ireland, who was much beloved in Ireland. St. Patrick is one of the most decorated saints of the Christian faith and is venerated by all major Christian denominations. The Irish Christian leaders of the 12th century saw it necessary to construct a cathedral in St Patrick’s honor. Construction of the cathedral began in early 1191, and it was consecrated on March 17th. However, the cathedral’s construction was officially completed 79 years later in 1270 after the addition of the Lady Chapel, making it the largest church in Ireland. St Patrick hosted the establishment of one of Ireland’s earliest universities the Medieval University of Dublin, which was founded in the cathedral in 1311. The church has seen the rise and fall of dozens of kingdoms in Ireland and has become one of the most domineering historical sites in Ireland. Local folklore has it that St Patrick’s Cathedral was the site from where the phrase “chancing your arm” originated after earls of Ormond and Kildare shook hands through a gaping hole in a door of the cathedral in 1492, and in so doing, ended years of conflict. The most distinctive feature of St Patrick’s Cathedral has to be its spire. Rising 141 feet in height, the spire is the cathedral's highest point and makes St Patrick’s Cathedral the tallest church, not only in Dublin but all of Ireland. Lady of the Chapel is another marvel of St Patrick’s Cathedral. The cathedral’s organ is another sight to behold. The organ is the largest in Ireland, and some of its parts date back to the 17th century. One more unique feature of the cathedral is its authentic Gothic architectural style, as a testament to the medieval period of its construction. At the fore of the cathedral lies the State Pew, the reserved seating area of the President of Ireland. The reason behind the seats is because the cathedral hosts important national ceremonies of Ireland, which are presided over by the President of Ireland. Throughout its history, the cathedral has experienced fires, wars, and floods but still stands tall. However, due to its advanced age, St Patrick’s Cathedral is vulnerable to damage and therefore, its conservation is of great importance. St. Patrick’s Cathedral is one of the few cathedrals without a crypt. The absence of a crypt during the cathedral’s construction was for its conservation as it sits only 7.5 feet above the water table.